It was held at the Del Mar Fairgrounds which would normally mean that there were some nice views, but it happened to be raining this day so everyone pretty much ran inside to dodge the rain. Since it was at the fairgrounds, there was plenty of close parking and I arrived early enough to avoid any traffic. Before I get into the review, I will disclose that I do not have any food allergies myself. However, when attending many get-togethers or playdates involving foods, coordinators will often ask for people to be considerate of others’ unique dietary needs when bringin snacks. So I thought this would be a great opportunity to not only score some swag, but find out what types of tasty and allergen friendly foods were out there! The morning started out with a free breakfast hosted by BFree Foods. They talked about their company and offered us coffee, bagels, juice, and fruit. We were then free to network with other bloggers and vendors before the expo officially opened. Then they gave us our own swag bags and we were off to explore! One cool thing about the expo is that each vendor has an information card on their table that lets you know if their product contains a particular sensitive ingredient. The event also featured authors and speakers that presented information all throughout the day. There seemed to be a good attendance at these classes since I saw several people standing for the presentation as the chairs filled up. I listened in on a couple of presentations and the presenters seemed enthusiastic and informative. There were TONS of vendors at this event so I won’t be able to mention every single one, but you can go to the GFAF Expo website to learn more. I will, however, touch on the ones that stood out to me! Enjoy Life Foods had a cute little set up, where you could score goodies along a maze-type structure. I also think their products are super tasty, especially those chocolate chips! Garden Lites offered up some pretty sweet waffles and Namaste Foods gave out delicious cake samples! One of my favorite vendors was Brazi Bites! I love these little bread balls and I’m hoping they come out with a cinnamon flavor at some point. You may have seen them on Shark Tank, but if not…definitely check them out in your freezer section! There were a couple of different Kombucha brands, but I enjoyed the ginger-lemon sample from Health-ade the most. Sunbutter had a pretty big presence at the event and they were generous with their samples and also handed out some little coloring books for the kids. Keli’s Hawaiian Sauces were pretty dope and I thought they would be great on all different types of foods. The folks over at RP’s Pasta were also very friendly and generous! I enjoyed the flavors from Rise Buddy Snacks, but unfortunately my kids weren’t too thrilled with this snack. Smart Flour Foods gave out yummy pizza samples and this also something that I would purchase in the future! I tried an interesting sample from Natti Bar. They’re basically bananas mashed into bars. Personally, I would prefer just eating a regular banana but others may dig these little things. Betsy’s Best offered samples of different types nut butters, but I just didn’t think it tasted much different than other brands. Glutenberg Craft Beers were one of the gluten-free beers representing at this event. I thought it tasted okay, but I’m also not big on craft beers so I’m sure others would enjoy this. It also looked like many people were skipping over the beer booths so I’m not sure gluten-free beer is a super popular thing. Another vendor that I really enjoyed was Aleia’s Foods. They offer a variety of gluten-free stuffing, bread crumbs, croutons, and cookies. I almost devoured a whole box of chocolate chunk cookies by myself. I couldn’t even tell they were missing any gluten! 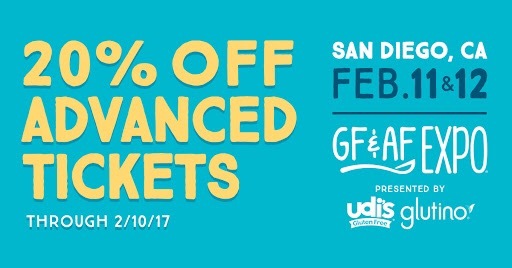 And use code “GFAF17” to save $1.00 on your online purchase! Towards the end of the day, I got to try a decadent German chocolate brownie from Coronado’s Gluten Free Pantry. I was also really drawn to their packaging so I definitely recommend checking out their products! There were also some non-food exhibitors such as: Beautycounter; Hands for Life Ocean Beach (They gave me a demo and I was informed that I needed an adjustment); San Diego Meditation (which I probably need); and some massage people that wanted to sell me a $200 device that felt like a shock treatment. The authors also had a few booths where they were selling their books. I only attended on Saturday, but I was able to hit up pretty much every booth. The place got pretty packed throughout the day, but I didn’t have to wait at the booths for very long. Every attendee was given an Enjoy Life reusable bag with some samples and coupons when they first walked in the door. Sprouts Farmers Market also gave out reusable bags with some greek yogurt samples as well as fresh fruit. I also received the BFree swag bag that included full-size bread samples, coupons, an infuser bottle, and a selfie stick! And because I was an official blogger, many of the vendors gave me some extra swag as well as their business cards for future networking. Yep, it was a pretty large haul! So much that I could barely fit it all in one picture! I also scored a huge stack of coupons for discounted or free items so that definitely added to the value. Overall, I really enjoyed this event! I learned about a lot of new brands and I was introduced to some interesting food items. However, I did feel that one genre of brands was missing. And that was cleaning products! I was really surprised that I didn’t see any natural cleaning product brands represented at this event. I also think they should have put our blogger names or social media handles on our badges since that’s what most of us go by in the blogger world. I recommend this event to anyone with a food allergy or that has a family member/friend with a food allergy. I also recommend this event to anyone that just wants to learn about new products or about healthier living in general! If you are planning to attend this event in your city, I do have a few tips! Arrive early! There are so many booths that it can seem overwhelming so give yourself enough time to get through most of the expo and catch a couple of presentations. Even better if you can attend both days! Come hungry! I literally just ate samples all day and I was full for the whole day. I even had to turn some samples down at the end because I was pretty stuffed. Bring water! There were only a few beverage vendors along with some water fountains at this particular venue. Bring enough water to get you through the whole day because you will be tasting lots of yummy foods. Be sure to check out http://gfafexpo.com/ to see if this event is coming to a city near you! Tickets run about $5-$35 which is totally worth it for what you get at this event. The price does not include parking so make sure to check your venue for parking details. You can also get involved by volunteering, blogging, or presenting at this event so be sure to check out the website for more info. Did you attend the GFAF Expo this year? I’d love to hear your thoughts! ***Note: I was provided free admission to the Gluten Free and Allergen Friendly Expo in San Diego as part of being an official member of the 2017 GFAF Expo Blogger Team. All opinions are my own. I’m off to review the next event! Do you enjoy eating healthy foods? Do you enjoy learning about new products? 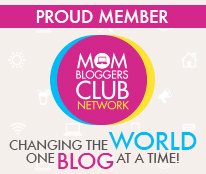 Do you like networking with bloggers and authors? Do you LOVE scoring SWAG?! If you answered yes to any of these questions, then you won’t want to miss the upcoming Gluten Free & Allergen Friendly Expo (GFAF) in San Diego! The event will be held at the Del Mar Fairgrounds on February 11-12, 2017. More details about the time, location, and parking can be found here. I am really excited to attend this event not only to score SWAG, but to also learn more about healthier food choices and to network with other health-minded individuals. There will be tons of samples as well as classes and presentations! Check out the schedule here. As a bonus, the event is being held in a beautiful location! 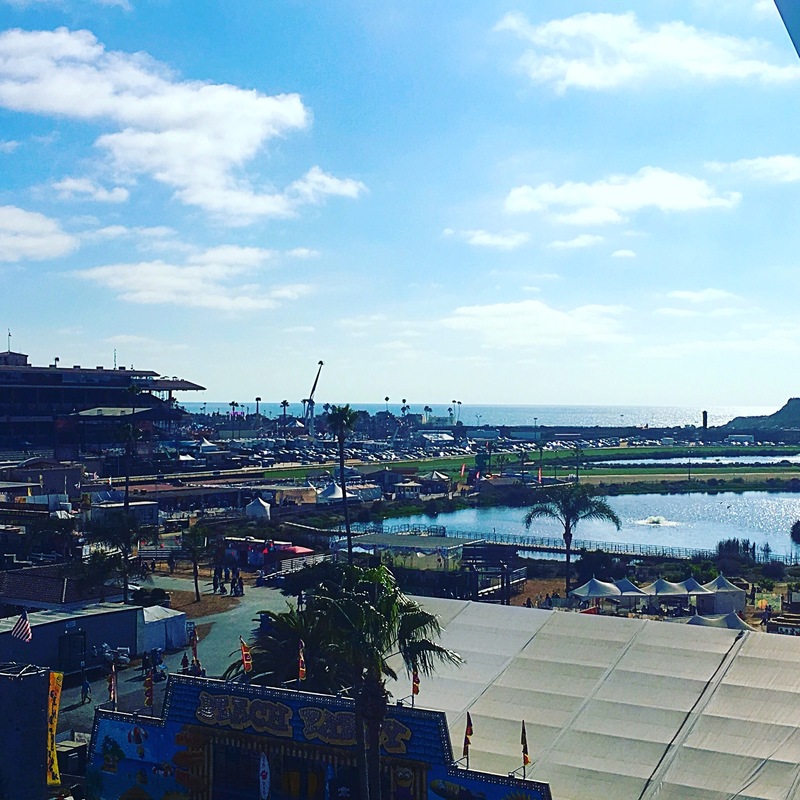 The Del Mar Fairgrounds offer great views and are located within walking distance to the beach! So snag a hotel and check out the sights after the Expo. It would make for a pleasant weekend getaway! So what should you expect from this event? You will get to explore over 100 vendors and brands! Discounted items to purchase at the expo! Classes and presentations about living a more gluten-free and allergen-friendly lifestyle! Free bag to carry all of your SWAG! An opportunity to meet authors and bloggers! This will be an amazing event that you won’t want to miss! I hope to see you there! Tickets cost between $5-$35 and you can purchase them here! And the sooner you purchase, the more you save! 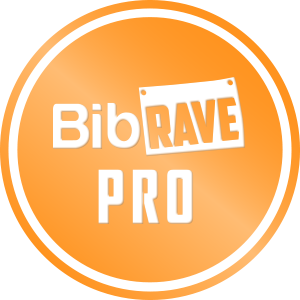 Use code “ADVANCE” to save 20%! As an added Bonus, I will be giving away tickets this month on my Instagram so make sure you are following me (@theswagmama) so you don’t miss your chance to win! ***Note: I am receiving complimentary admission to the Gluten Free Allergen Friendly Expo in exchange for participation in the blogger program. I am also associated with the affiliate program for ticket sales.